Nidoking in game: 662 Who? Important notice! Pokemon Nidoking is a fictional character of humans. He evolves from Nidorino when exposed to a Moon Stone. It is the final form of Nidoran♂. Nidoking is a large, bipedal, purple Pokémon with distinct reptilian features. It has narrow eyes, large, spiny ears, fur-like tufts on its cheeks, and a short snout filled with pointed teeth. There is a long, venomous horn on its forehead and a ridge of spines down its back. Gray plates cover its chest and belly, and there is a gray rounded spine on each elbow. Each hand was three claws, while foot has only a single hoof-like nail. It has a long, powerful tail. 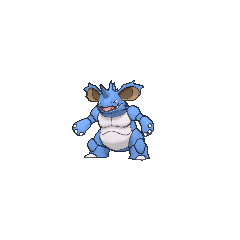 This is a male only species; the female counterpart is Nidoqueen. It is said that Nidoking's tail is capable of toppling a metal transmission tower. Nidoking uses this tail to smash, constrict, or break the bones of its prey and enemies. The tail can be swung to compose distance between it and its foes before Nidoking charges. Its steel-like hide adds to its powerful, rampaging charges. Nidoking lives in grasslands. Gary Oak has a Nidoking that first appeared in The Battle of the Badge. He called on it to battle Giovanni's Golem during their Gym battle. Nidoking was shown to have tremendous power as he managed to Tackle Golem head on, launching it across the battlefield, and defeating it in one hit. However, when Giovanni used Mewtwo to battle, Nidoking was no match, and was defeated handily. 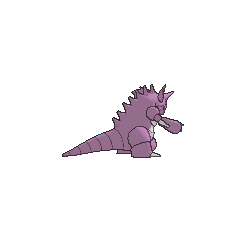 Gary's Nidoking was briefly seen again in The Fourth Round Rumble battling Melissa's Golem, but much unlike his battle with Giovanni's Golem, he was defeated easily. Jessie and James were attacked by a pink Nidoking in In the Pink. A Nidoking appeared in the episode Showdown at the Oak Corral, trying to mate with Cassidy (who was in a Nidoqueen costume at the time). A Nidoking appeared under the ownership of Oscar in The Bicker the Better. His girlfriend Andi had a Nidoqueen. They had a Double Battle with Ash and May, and due to Oscar and Andi's communication with each other, they were able to defeat Ash and May with relative ease. A Nidoking appeared in A Pyramiding Rage! under the ownership of Paul. He was used to battle against Brandon's Registeel. Although shown to be powerful and versatile, Registeel was still able to hold its own and brought down Nidoking. Two Nidoking appeared in Arceus and the Jewel of Life under the ownership of Damos. A Nidoking appeared in Mystery on a Deserted Island!. Nidoking first appeared in A Chansey Operation as a sick Pokémon. A Nidoking belonging to the natives of the Golden Island, appeared in Meowth Rules!. Nidoking also appeared in The Power of One. 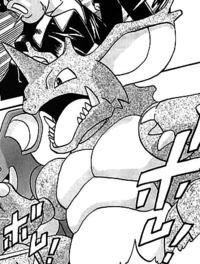 A Nidoking was seen in a fantasy in The Rivalry Revival. A Nidoking was seen in a dojo in Wired for Battle!. A Nidoking was one of the Pokémon competing in the Pokémon Sumo Wrestling in Ring Masters. Multiple Nidoking also appeared in Celebi: Voice of the Forest. 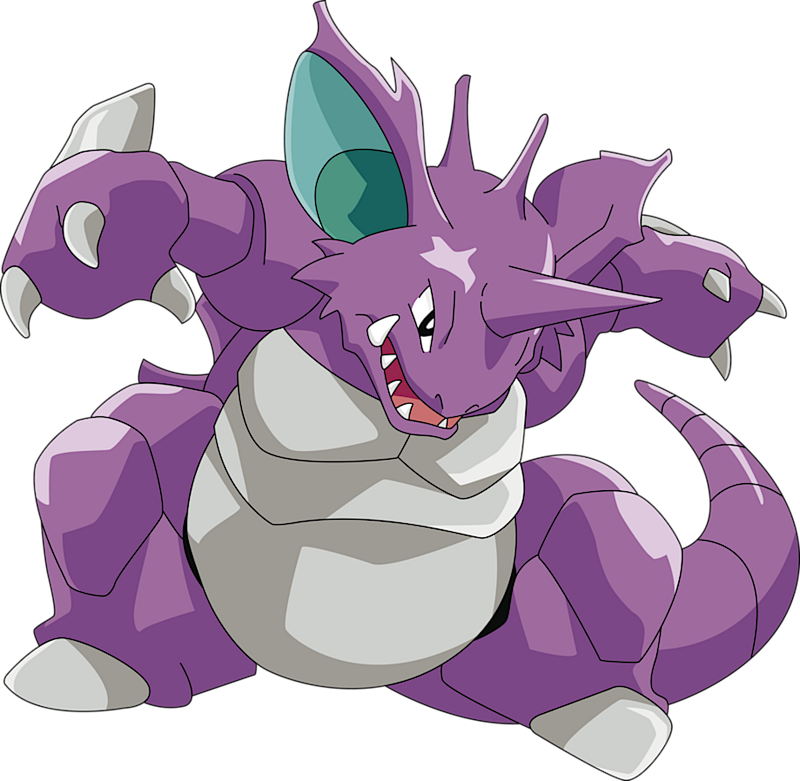 A Nidoking was one of the Pokémon defeated by Wings Alexander's then Hoothoot as seen in his flashback in Throwing in the Noctowl. In As Cold as Pryce, a Nidoking appeared in Pryce's flashback as one of the Pokémon which fought against his Piloswine. A Nidoking under the ownership of an unknown Trainer battled in a qualifying match for the Silver Conference in A Claim to Flame!. 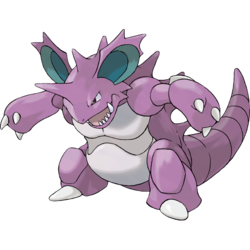 A Nidoking was among the Pokémon used to attack Dawn, Brock, Officer Jenny, and Solana in Pokémon Ranger and the Kidnapped Riolu! Part Two. A Nidoking also appeared in Historical Mystery Tour! with a Nidoqueen. A Nidoking appeared in the opening scenes of Zoroark: Master of Illusions. 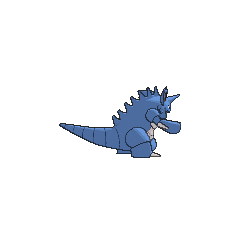 A Nidoking appeared in SM003, as a silhouette. AG072 Nidoking Ash's Pokédex Nidoking, the Drill Pokémon. Nidoking swings its large tail about to compose distance, then charges in with the full force of its body behind it. Red caught several rampaging Nidoking in the Safari Zone in A Hollow Victreebel which two appeared in the previous round Long Live the Nidoking! fighting for a Nidoqueen. A Nidoking was seen in a Poké Ball at Oak's Laboratory in Cherrygrove in Off Course with Corsola. 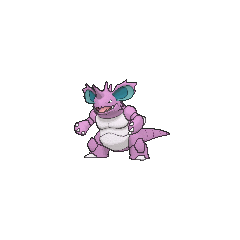 Another Nidoking appeared in The Last Battle XIII as one of the Pokémon sent to help the fight in Ilex Forest. Nidoking shares traits of rhinoceroses, gorillas, rabbits and porcupines.